Following reports that the parallel crossing on Huntingdon Road wasn't working well Cambridgeshire commissioned TI to investigate. We found that cyclists experienced greater delay than pedestrians, users were delayed more on the first half of the crossing and the narrow footways made it difficult for cyclists to indicate they wanted to cross, but it gives a better service than a toucan would. 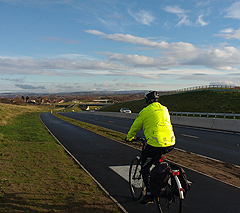 In January 2019 we were commissioned by Stockport MBC to audit cycle & pedestrian facilities on the new A555 A6-Manchester Airport Dual Carriageway. 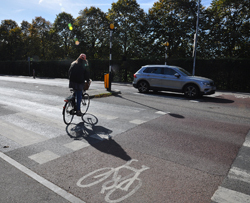 The audit included design details, direction signs & a study of how the road improves Stockport's "cycling offer". The route along the new road is popular with cyclists because it is smooth and continuous but interestingly popular with pedestrians. Transport Initiatives, with Urban Movement, has been investigating the feasibility of a bike share scheme in the town. A small Nextbike scheme based at the University of Surrey was launched summer 2018, which has had higher than expected use.We used our bikeshare experience in many other towns and cities to prepare a business case for funding and developed proposals for docking station sites. Mark and Ken have recently completed a review of Crawley's cycle network. An audit showed the town to have no coherent network despite some lengthy cycle tracks. 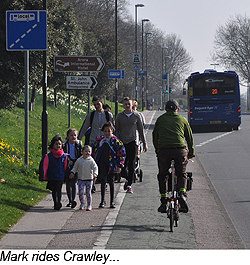 TI undertook a LCDS classification analysis and an assessment of cycling demand before devising interventions and fitting the recommended cycling improvements into the Crawley Growth Programme. As part of its LSTF programme Warrington Council wanted to improve non-car access to its main employment areas, many of which were sited away from where people lived. We undertook and accessibility audit, reviewed their cycle route network devising scheme to fill gaps, produced a direction signing strategy and implementation plan. Warrington now has a 92km cycle network covering most of the town. Client; Brecon Beacons NPA. 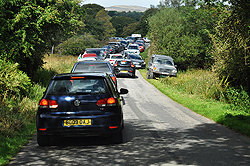 Increasing visitor numbers to the "Waterfall Country" has severe impacts on residents, businesses and the environment. 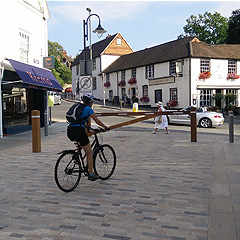 TI undertook traffic & visitors surveys and worked with residents, businesses & public bodies to devise multi faceted solutions including temporary car parks, segmenting the product, rebranding the footpath network and a rural controlled parking zone. Success in Active Travel! Due to increasing numbers of cyclists the City of London has capacity problems with some of its advanced cycle stop lines and so commissioned TI to assess whether any needed enlarging. We needed to devise a capacity indicator, never done before as very few ASLs ever get overloaded. LB Lambeth commissioned TI to review the council's cycle network, assess cycling potential and produce an outline revised network for future consultation and implementation. 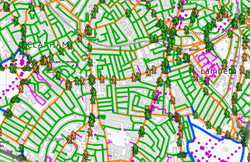 This involved a CSNA audit, a London Cycle Design Standards analysis, a updated network and an assessment and prioritisation of "gateways" with an outline design for 10 of them.